Librarian of Congress Carla Hayden. American University will celebrate nearly 500 graduates who will participate in a Fall Commencement Ceremony on Wednesday, Dec. 21. 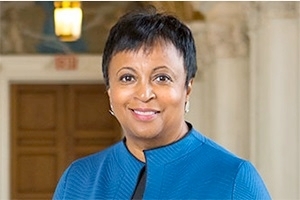 Dr. Carla Hayden, Librarian of Congress, the first woman and first African American to lead the national library, will be the keynote speaker at AU’s 132nd commencement ceremony. She will be awarded an honorary doctoral degree. The accomplishments of AU's August and December graduates will be celebrated during the ceremony in Bender Arena on AU's campus at 1 p.m. The ceremony was added to accommodate the growing numbers of students graduating early. Dr. Hayden was sworn in as the 14th Librarian of Congress on September 14, 2016. She earned her B.A. from Roosevelt University and an M.A. and Ph.D. from the Graduate Library School of the University of Chicago. Hayden’s career has included stints at public, academic, and special libraries. She began her career with the Chicago Public Library as children’s librarian. The Library of Congress is the largest library in the world, with millions of books, recordings, photographs, newspapers, maps and manuscripts in its collections. It is the main research arm of the U.S. Congress and the home of the U.S. Copyright Office. The Library is the nation’s oldest federal institution, founded in 1800. Shortly after being named to the nation’s top librarian position, Hayden described her appointment in an in a PBS NEWSHOUR interview as “a librarian’s dream”. She indicated early on that she is an advocate for making information free for all and that this is a pivotal time to think about what can be done with technology. “This library can really help libraries throughout the country show the worth of a library and a community,” she said. “I encourage you to visit the Library of Congress in person (in Washington, D.C.), explore the Library online from wherever you are and connect with us on social media,” says Hayden. Hayden was president of the American Library Association from 2003 to 2004 and has been a member of the National Museum and Library Services Board since 2010. In 1995, she received the Library Journal’s Librarian of the Year Award in recognition of her outreach services at the Pratt Library, which included an after-school center for Baltimore teens offering homework assistance and college and career counseling. For more information about Commencement, visit the AU Commencement site.